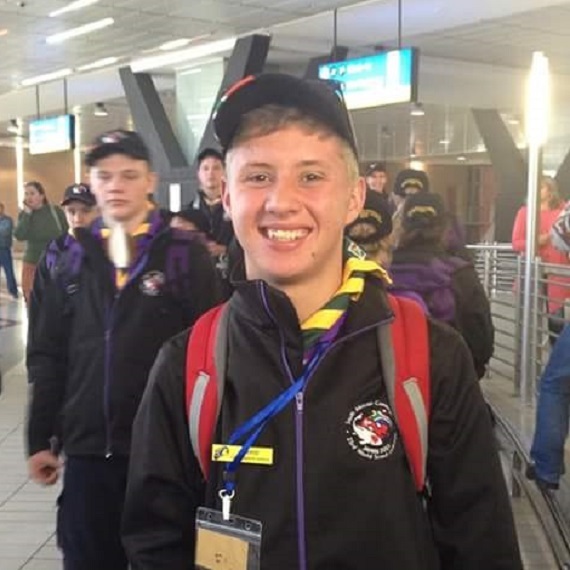 Bryce Haggard was one of the many Scouts from South Africa that participated in the 23rd World Scout jamboree in Kirara-hama in Japan earlier this year. Adamant to attend this once-in-a-lifetime event, he implemented an elaborate fundraising plan whereby he worked very hard during the holidays and started a recycling project to generate funds. We spoke to this dedicated Scout who put his skills into practice in order to achieve his “ultimate Jamboree Experience” and become a true “Messenger of Peace”. My name is Bryce Haggard and I’m 17 years old. I live in Benoni in Gauteng where I attend Scouts at 6th Benoni Scout Group. I am the youngest of 3 siblings and have been raised by a single parent since I was 2. Scouting is a “generational movement” in our family and so my mom encouraged all of us to join the Scouting Movement. My grandfather was a Queen Scout and attended the 9th Jamboree in 1957. My uncle was a Springbok Scout. My brother Kerdrick is 24 years old and was a Land Scout. He attended the 21st Scout Jamboree in the United Kingdom in 2007. My sister Chloe is 22 years old and was a Sea Scout. I have been involved in the Scouting Movement since I was 6 years old. I have been a Cub and Scout at 6th Benoni for the past 10 years and just completed my First Class. I am doing grade 10 through a home schooling programme. This gives me the flexibility to study as well as allowing me to focus on achieving my Springbok. There are so many activities for teens outside school, why the Scouts? I am involved in Scouting because I am passionate about my community and being a Scout has allowed me to give back in so many ways. I also love camping and the outdoors. Many young people in my community spend Friday nights at the mall, watching movies and doing drugs. Being a Scout has ensured that I will never become just another teen statistic. The greatest reason of all for me to stay in Scouting is that I was selected to attend the 23rd World Scout Jamboree in Japan! In order for you to take part in the 23rd World Scout Jamboree in Japan you worked hard to raise the funds to go. How did you do that? How did it feel to be there and be part of such a big community? In July 2014 I was selected to attend the 23rd World Scout Jamboree and took up the challenge to raise the funds needed to ensure that I didn’t miss out on this opportunity. In November 2014 I got a job as a waiter at a local family restaurant in Boksburg. I worked during the December holidays. Then from February onwards, I worked 3 nights a week and during the weekend. I knew that I would never raise enough money in the time I had, so I also began a Recycling Project in my local community. I collected recyclable materials from the local library, restaurants and residents to sell for cash at the Recycle Depot in Benoni. During the 8 months before leaving for Japan, I worked very hard to raise funds and to achieve my First Class. I made several sacrifices and never had any time to socialize with friends. But the Jamboree experience made all my hard work and sacrifices worthwhile. I felt truly honoured to witness and be part of such a large scale Scouting event, waking up every morning at the jamboree with the opportunity to meet new people, form new friendships and embark on new adventures allowed me to realize how blessed I am to be part of the world wide Scouting Movement, it’s an indescribable feeling that I hope every young Scout can relate to. There are many people with different cultures. Did you find out more about their lives and their ways of Scouting? There were so many different cultures! I can’t even remember how many there were, the Jamboree was a melting pot of diversity. 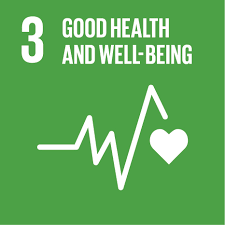 There were 36 000 young Scouts aged between 15 and 18 years from 144 countries. 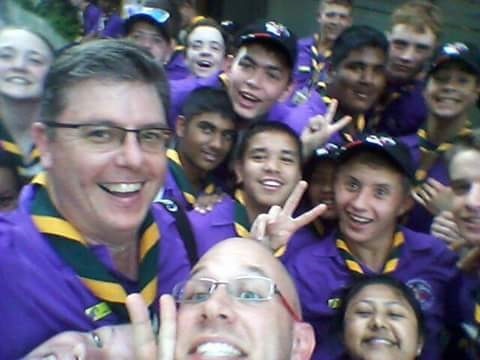 It was extremely nice to hear and find out how Scouting is done all around the world. I also learnt more about my fellow Scouts daily lives and lifestyles. All in all I found out that we as Scouts and human beings are no different on the whole, but a few distinct differences here and their makes as all individual and unique, this essentially unites us as the human race. How does Scouting differ in SA and in Japan? The Scouting Advancements are different and they are far more disciplined especially, in things like time management. Scouts around the world are very much alike, a few notable differences however are things like our uniforms, badges, camping styles, country specific knots and cooking, but again one thing that does unite us is the ‘Spirit of Unity’ and an ideal for a better world. We left religion, politics and race issues in our home countries. Scouts came from around the world to make friends, have fun and larn how to build a better world and a better future for all. “WA Spirit of Unity” means many things such as unity, harmony, friendship and peace. Moreover, it also represents the essence of Japan, a country where traditions and the latest technology co-exist in harmony. I was truly inspired and have come to embrace it in my daily life. What activities did you do during the Jamboree? Did you also participate in a community project? I did several activities and earned my Friendship Award. Our Jamboree Scout Troop Tamboti also took part in activities such as the Science experiments, Water and Nature activities, Global Development Village, Cultural Day and Peace modules. We visited several Contingent booths at the Scout Centre and visited the Faiths and Beliefs Zone. We also joined other Contingent Units in a meal and played Japanese games with Japanese Scouts. We also got involved in a community project around the jamboree site. Being involved in this kind of activity is what scouting is all about, coming together with a common purpose and making a difference in the lives of others. I truly enjoyed this!